Bands go their separate ways. It’s just a fact of life. I was able to see one of the great bands of the ‘aughts, the Walkmen, play their first last show ever at Union Transfer three years ago and I’ve been keeping tabs on the band’s members ever since. Guess I’m trying to rekindle the magic that the Walkmen created by catching glimpses of each of the member’s solo acts. Anyway, it was in the extremely intimate Black Box of Underground Arts June 1 that I saw ex-Walkmen Hamilton Leithauser and Paul Maroon put on a splendid two-man performance. People were scattered about the couches and little tables placed around the Underground Arts’ Black Box, a side room off of the main venue space. Everyone stayed put as opener the Jackfields played their set. But after Leithauser and Maroon took the stage everyone (maybe 40 in total) snuck up towards the duo. Leithauser opened up with “5 AM,” a song from his debut solo album “Black Hours.” It was great to hear a familiar track right up front because I knew the rest of the set would likely consist of songs from Leithauser and Maroon’s latest collaborative album, “Dear God.” I had not been able to listen to “Dear God” and what I had heard did not impress me much. Though it was a very cursory listen, I found the arrangements very sparse, uninviting even. But after hearing the songs in person I have come around a bit. Songs like “Proud Irene,” “Annie’s Going to Sing Her Song,” and “How and Why?” were a treat live. Leithauser’s vocals and Maroon’s musicianship are incredible to witness in person. Leithauser looks like he is ready to break in half sometimes when he rears back to deliver some of his lyrics. He gets right up on his toes and croons in a very visceral fashion, something well-suited to a Callowhill basement instead of an old-timey lounge. It was neat to hear Leithauser cover “All of Nothing at All” by Sinatra; a rock star covering the Sultan of Swoon. 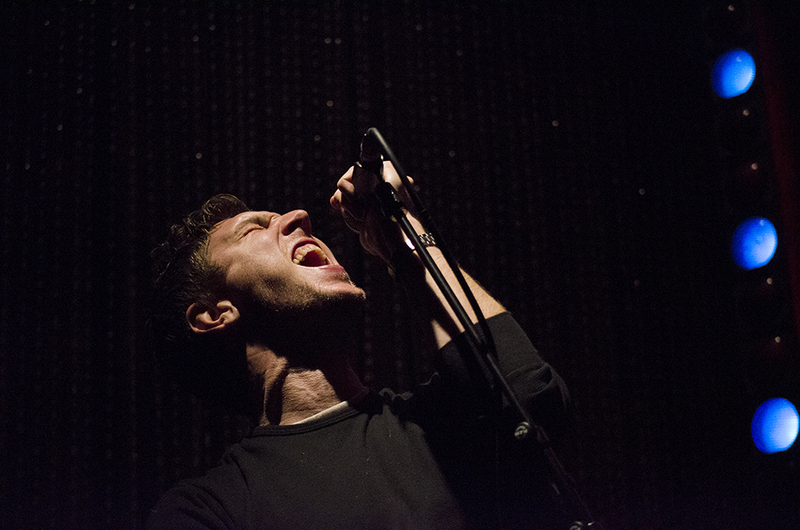 Leithauser introduced Maroon as his “one man band” and he certainly lived up to the billing. Armed with a baby grand piano, Fender Jaguar and a weathered old amp, Maroon supplied some great backing music. On the title track from “Dear God,” Maroon showed off his piano chops at Leithauser’s behest, which delighted the crowd. A couple of songs in, Leithauser announced he is releasing a second album, with a full rock n’ roll backing band, this September. It was great to hear that Leithauser was getting back to his roots. He even debuted a song from the album, “The Bride’s Dad,” which had a little more giddy-up than the tracks from “Dear God.” Keep your eyes peeled for that record come September. It’s cool to be a part of a very small crowd asking for an encore because there is the slightest fear that the small amount of applause you can muster might not be enough. But my fear was unfounded as Leithauser and Maroon came out to play just one more song, “11 O’Clock Friday Night” from “Black Hours.” It is a great, great song that features Maroon playing the song’s marimba part on guitar and then ripping off a sweet solo to end the song. Two-fifths of the Walkmen put on a great show in the intimate Black Box. I’m sure they’d rather be referred to as solo artists at this point but it’s hard to separate them from where they came from. It’s interesting to see the different paths the Walkmen have taken on their solo journeys. Leithauser and Maroon have decided to make the journey together and we are all off better because of it.